I sure would like to be warned if humidity rises from 27 % to 43 % within 10 minutes! I like to pick your brains, experience, gut feelings… It has to do with the data loggers I’m currently building and testing. We all have our set temperatures and humidity levels we don’t want the values to drop beyond or go above. We sure want to know if the humidity level in our storage for metal objects exceeds 55% or the temperature drops beyond 11 °C (51.8 °C). So it’s quite logical that we want our device to send us a warning when this happens. Imagine you had a device that warns you about sudden climate changes within a 10 minutes time span on your prefered channel (email, twitter, cell phone), what would you pick as trigger value? 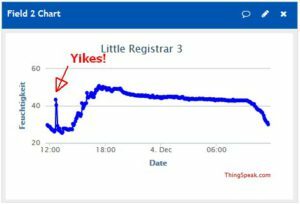 What would you choose as a trigger value for relative humidity change within 10 minutes in your storage? 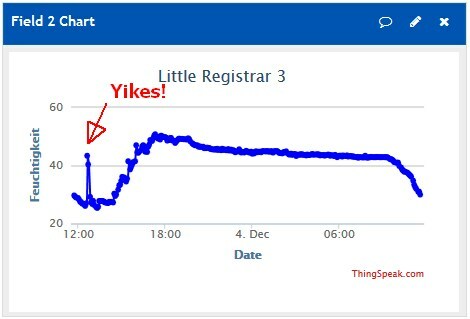 What would you choose as a trigger value for temperature change within 10 minutes in your storage? I don’t think I can give a hard-and-fast answer to your questions, because a lot depends on factors such as the logging interval (5 mins, 15 mins, 30 mins?) and the space where the logger is installed. Is it physically possible for the RH to have increased by 5% in 10 mins? Or is it more likely that a passing member of staff blew on the sensor “to see if it was working”? If you have just one high reading (as you have in your graph above), I would be inclined to blame that, or just a momentary malfunction of the logger – a glitch.